I have wide interest in the retro computer and console platforms. They are one of my hobbies and I am buying, collecting, archiving, researching, developing for, documenting and mainly enjoying retro computers and consoles for some years already. I read on some forum that the stock bazaar Ilianci still have a shop where Sega and Nintendo compatible consoles and cartridges for them can be bought. On 4th of May 2009 I had a visit at the bazaar. Many shops with cheap stuff are there, mainly for clothes, but the electronics have their fair presence as well. After some questions in the electronics shops around, asking what consoles they are selling, I saw a box with picture of Sega Mega Drive. I asked the seller what is the price and he told me 45 BGN with one cartridge for free. Oh well, only one cartridge, I have to search for more. But they are hard to find. Then I looked at the other consoles, and saw the GSD console. I asked what is the price for the GSD, and it was 30 BGN. 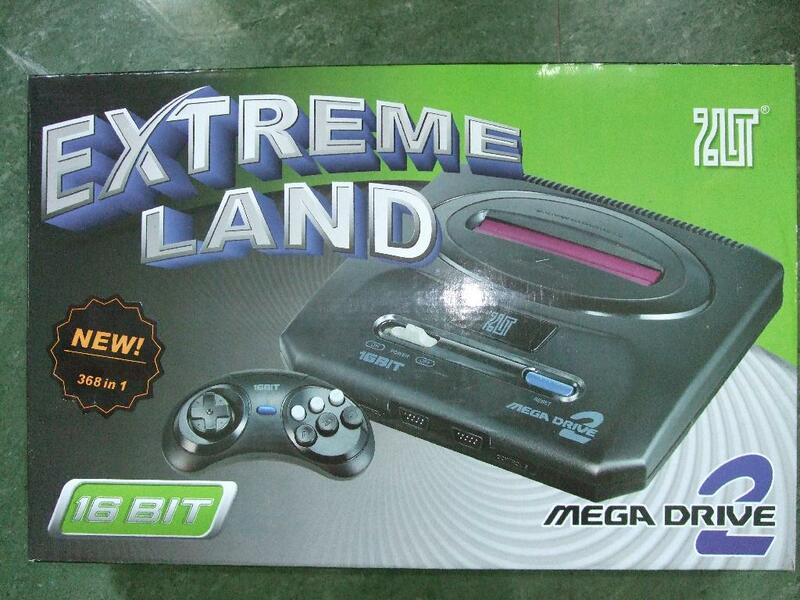 After some negotiations, almost turning off the offer and further negotiations, I left the shop with the Sega Mega Drive II clone called Extreme Land Mega Drive 2 and the NES clone GSD-1988 . For all the consoles I paid total 80 BGN, including 2 Sega Mega Drive cartridges - Davis Cup World Tour Tennis, and Superman and 6 NES cartridges - 2 included in the GSD package - 48 in 1 and 17in1 , and four cartridges separately - 133in1 , 1000000in1 , Iron Tank and 80 in 1 . The price I paid the for Extreme Land with the two cartridges is the half of the two or 40 BGN. Even if I have emulators for these machines, it is always nice to have the real hardware, especially if you develop for them like me, so you can test on them games and programs and see how they perform on the real hardware and under emulation. These tests and observations help making better emulators and more polished games for the machine. Since these machines are small and easy to handle, it is no problem having them at home. The console comes in a nice big box with pictures on it. The dimensions of the box are 42.5/27.3/8.5 cm. 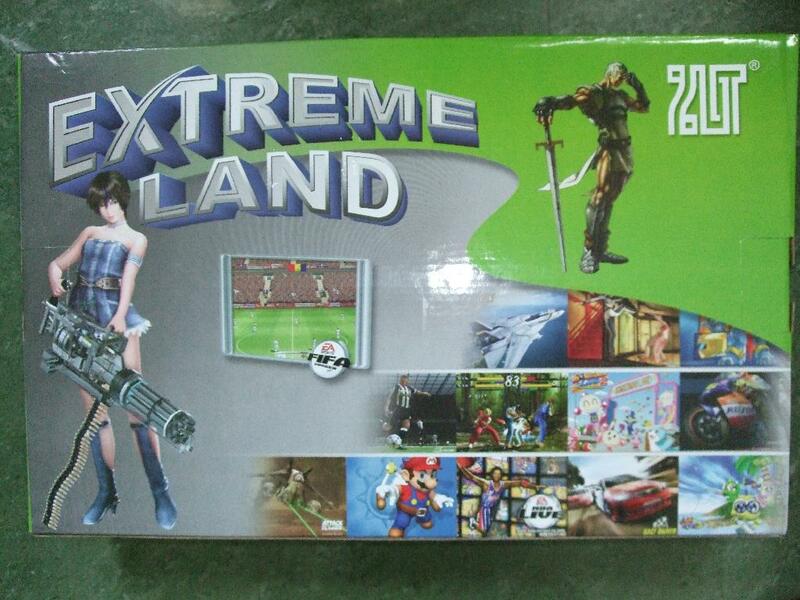 In front of the box is the big Extreme Land title with a little bit cryptic font for the 16 BIT (R) logo on the top right. Under the title is a picture of the console in front view and one controller pad without wire. On the left is a sticker NEW! 368 in 1 . On the bottom left is another stylish 16 BIT logo on green background and on the rightmost is the Mega Drive 2 title, written with Arabic number for two. There is nowhere mention of Sega, so only by the look and the knowledge of this platform, the buyer can know that he is buying a Sega Compatible. 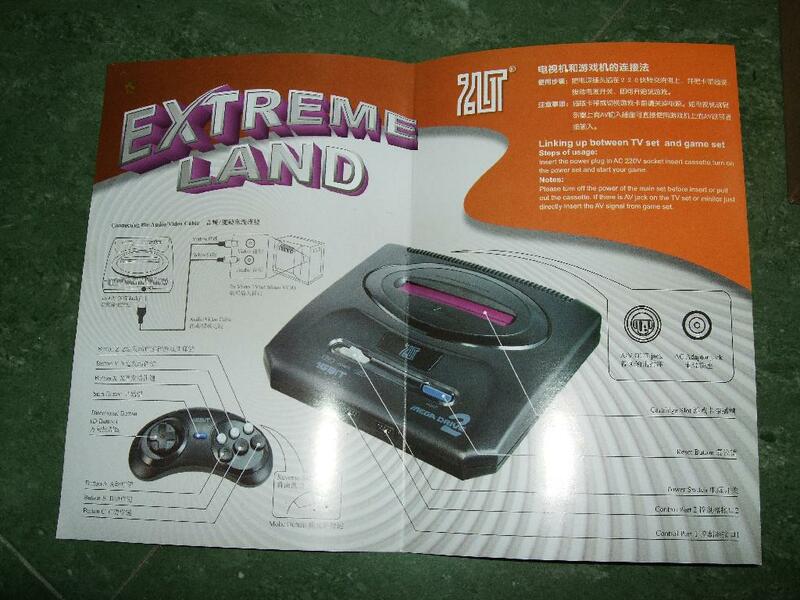 At least the Mega Drive 2 name is a guide that it has something to do with Sega. The 16 bit logos and the look of the controller pad, are hinting that it is not an 8 bit console. At least the seller gave his word that it is 16 bit Sega Mega Drive compatible machine and he sold many 16 bit Sega cartridges for them. I took it on trust, as I did not have the time to test it at the shop. On the back of the box there is also no help about what really the console is and what games should work. There is the Extreme Land title again, on the top left. On the top right is a knight resting and thinking and the cryptic 16BIT (R) logo again. Under the title is a 3D rendered girl with machine girl. On the center is a screenshot of EA Sports FIFA Soccer , but with much better version than the ones I remember on the Sega. From the center to the bottom right are various screenshots of Playstation and PC games. I was able to distinguish the games Tekken , Street Fighter , Bomberman Land 2 , Moto GP3 , Race Driver , Attack of the Clones , Super Mario Sunshine , NBA Live 2002 and Race Drive . Even if don't have these games, they were easy to identify, since the box designer did not bother to remove the copyright signs or create screenshots by himself. The soccer screenshot at the center made me think that a sport game is in box. 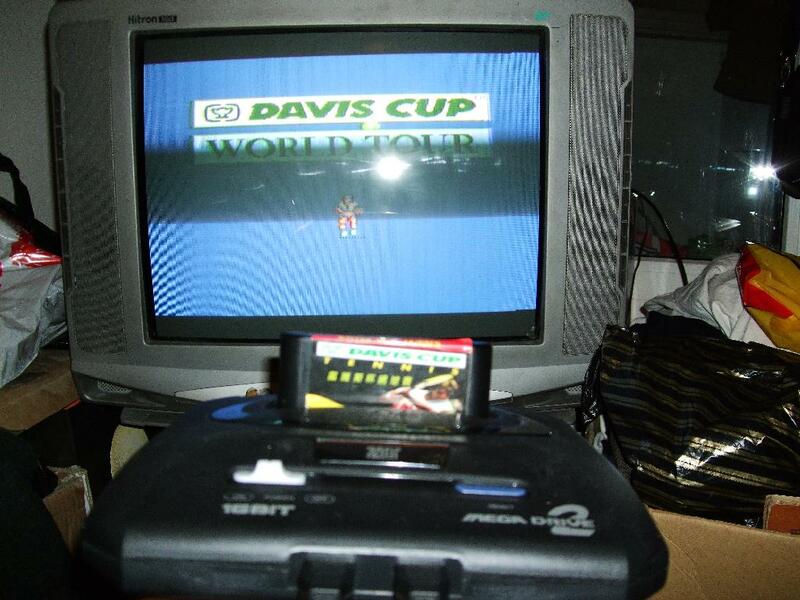 I was right - it was a sport game inside, but tennis, not a soccer - Davis Cup World Tour Tennis was inside, written as Davis Cup Tennis on the cartridge. After bringing the console home, I went to unpacking it and see what really is inside. The contents of the box are: the console itself, put in a nylon with warnings; 2 controller pads - the 6 button version of the Sega Mega Drive pad with 9 pin female D-connector; one game cartridge; power adaptor; instruction manual; RF Cable; Audio-Video cinch cables. The contents were in very good condition, except the cartridge, which had the sticker unglued and placed curved on the plastic. The console is not heavy, with dimensions of 22/21/5 cm, much more lightweight than I remember the Sega Mega Drive was. On the top are the Cartridge input with the text HIGH GRADE MULTIPURPOSE USE , the POWER and RESET buttons, two 16 BIT logos and Mega Drive 2 logo. In front are the plugs for the controllers, while on the back are the Adaptor and A/VOUT plugs. Exact replica of the Sega console. The controllers are also exact Sega replica with the 6 buttons and the additional MODE button. On the back MADE IN CHINA is written. 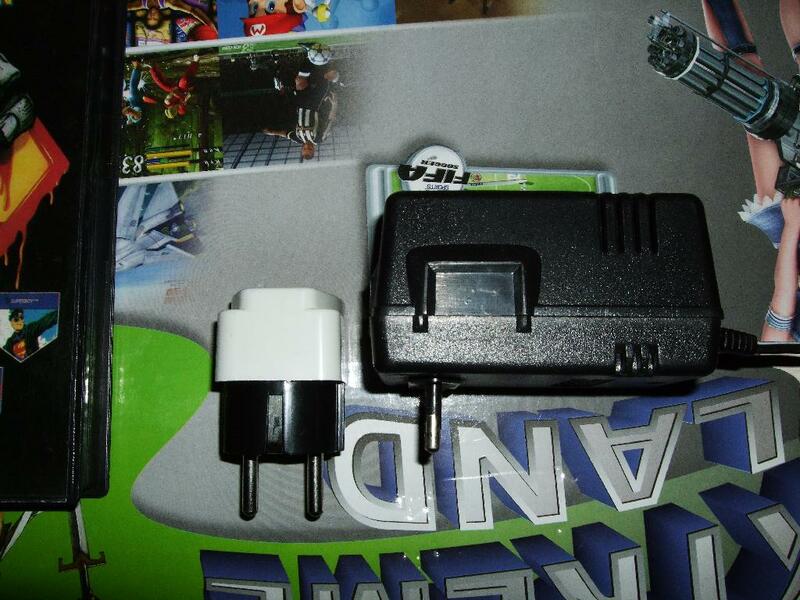 The power adaptor was original SEGA AC adaptor for Mega Drive, Mega CD and Game Gear. I am not sure if the console comes with this adaptor, or it was replaced by the seller, if the included was not working. The instruction manual is only one A4 sized page folded at the center, with English and Chinese instructions about the console - description of the parts, the controller buttons, ports of the console and buttons. Also written is guide for linking to TV set with Steps of usage . The real instructions are on page two and three, while the first and last pages are Titles and Logos. I like it very much this way - the console should be really easy to use and fast to install, without long instructions and complications. The RF adaptor was also original Sega product, MADE IN JAPAN . The RF and A/V cinch cables are long, unlike the controller cables which were only 70 cm long, which is a problem if I want to play at distance from the TV and the console. After reading the instruction manual, which took me no more than a minute, I went to the really interesting part. Following the instruction manual, I only had to Insert the power plug in 220V socket insert cassette, turn on the power set and start your game . It sounds really easy, but for me it was little more complicated. The power adaptor plug in was not able to insert into any of the sockets I have at home. All my sockets are Schuko, while the adaptor had much shorter plugs, which were unable to get to the powering. I remember some years ago that I had an 3 way adapter but I used it for connecting 3 plugs on one socket. I had several chooses from here - to make the adaptor plugs longer, which is the more dangerous method, or use Shucko to USA adapter, which I went for, just to be on the safe side. The connection of the controllers and the A/V jacks was easy without extra force required, even if the console was new, and only after some minutes, when having all the needed parts, the console was connected to my old SAMSUNG CK21S1TB TV with Davis Cup Tennis cartridge inserted. I used the A/V cables for connecting, because I know this gives much clearer picture, compared to the RF connection. I turned on the console with sliding the power button to the right. Immediately after turning on the console the inserted game appeared. The shown picture although not crystal clear as I am used to when watching the Amigas on monitor, is good enough for playing, especially if the player is far from the screen. The controllers are easy to press and play with them. The sound is okay, without noises, and the games play exactly as they should on 16 bit 68000 powered machine. 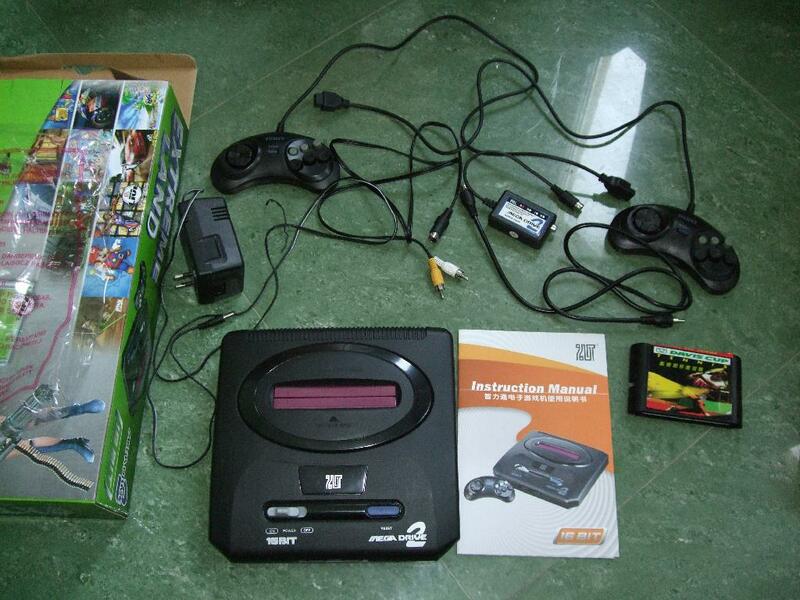 I was happy owner of 16 bit Sega compatible console, again, more than 15 years after I touched one for first time. The brand new console was working okay on the old TV set, with the same feel as it was back then. I played some sets on the tennis, then went to try the other game I had - Superman, and it also played fine. Both cartridges worked and I played for some hours. The console and the adaptors were only slightly warmer, than when they are off. After some games, I tried the console on the LG M228WA 22 inch TFT monitor which I use for my AmigaOne, but it also have AV input and TV tuner. First I tried it with the RF cable, to see if it works at all. The picture through the RF cable was so bad compared to the AV cable, that it is not recommended, even if the AV cable does not give the best picture possible, it is much better to use AV instead of RF. The RF output shall be used only if there is no other option available. The picture was clear with the AV cable to the LG display as well, with only small artifacts. I played some more game on the TFT monitor as well and enjoyed the console. During the swaps of the cartridges, I noticed that they not always fit easy, but I did not push harder in scare of breaking it. Looking through the cartridge slot, I saw that there is no main board above the slot. I opened to see what is inside. 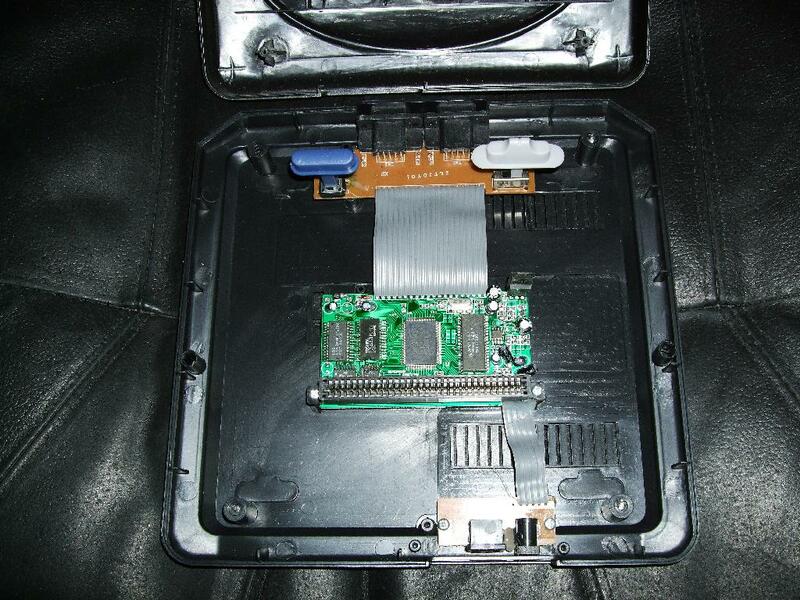 To my surprise, the console case was almost empty and the main board was very small, placed in the center of the console. It had only 6 chips on it. It was sized 9.4/5.3/2 cm, including the slot. From the mainboard, a narrow cable was going to the adaptor plug and the A/VOUT. Another wider cable was connecting different board with the controller plugs and the POWER and RESET buttons. The whole console was very tiny, and no wonder that it does not get warm and is that light. It is possible to put it in much smaller box, but then it will lose the Sega look and even less people will notice that it is a reworked Sega Mega Drive hardware. Having such small boards, means that some old hardware hacks, which were made on the older machines are very hard or impossible to make on this board, but there are still possibilities for modifications to the cartridge slot. I suppose all this smaller design, the shorter cables and the cheap look of all is to really make the console cheap. Putting the whole console on such small board, reduces the cost noticeably. The Sega Mega Drive is the Sega's best selling console ever. It had more than 10 years of commercial living. The console have wide variety of games in many genres. The two Sega Mega Drive games I played on the 16 BIT Mega Drive 2 played and behaved exactly like on original Mega Drive without any bugs. With the full Sega compatibility, the Mega Drive 2 console can play all the titles released for the original Sega's hardware. This means that all the popular Sega titles of the early to middle 1990ies are available. As I do not have a flashable cartridge, I was unable to test other games. After the commercial decline of the Sega, several less popular games were released, and many titles from the homebrew scene. I have also released a game for the Sega Mega Drive, called Cat at Crossroad , available in the Sega section. Taking into account the obsoleteness of the console and the cheap price of the games for it, it is very hard to find games on cartridges, but it is not impossible. Still better bet is having some way to transfer the games to it from a computer. 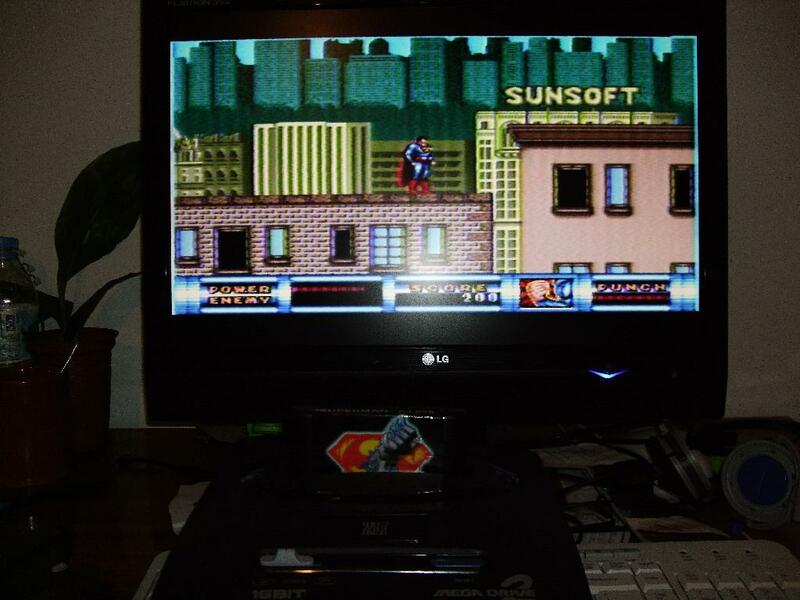 I am glad that I was able to find the extra cartridge with Superman . On the other hand there are still online shops who sell Sega Mega Drive games, and there is even a new development for sale directly from the publishers. As of 6th of May 2009, the games Beggar Prince and Legend Of Wukong are still on stock and can be purchased for delivery around the world. Even if very hard mission, games are possible to obtain for the console. Games, intros and demos are available on the Internet, which were never released on cartridges. Coding the console is fun, so there will be more releases in the future as well. The console should work with all the ordinary Sega accessories. As I can not find any old Sega accessories, I was unable to test their compatibility on the console, except for the Sega controllers which work fine. Emulators for the Sega Mega Drive console exist since years. One of these emulators is the DGen, another is GenesisPlus. These emulators play games very good and I can use USB controller for playing them, having much better options than the 6 button Sega controller. Nevertheless, having the original console, reworked with new hardware is a plus for testing the cartridges on original hardware, playing the games on old TV and fast startup of games. I do not regret buying the console and will use it for entertainment in the future. I am a glad owner of replica of the Sega Best Selling console. I have tried original Sega Mega Drive controllers on the machine and they worked without problems. Compatibility with original controllers means that I can easily obtain more pads, if I need to. The classic Mega Drive II in the same old shell, but on new hardware is a nice addition to my hardware store.